Paper • ISBN-13: 9781560256328 • US $13.95 • 9.0 in x 6.0 in • 252 pgs. Before John Sayles was an Oscar-nominated screenwriter and celebrated independent filmmaker, he was a National Book Award-nominated writer of fiction. Now John Sayles has written his first short story collection in twenty-five years. 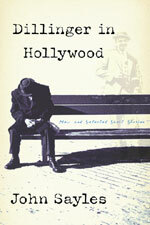 The supposed John Dillinger, a legendary outlaw who had been popped at the Biograph Theater, was simply a “stand-in.” Sayles’s stories, like his movies, are panoramic in scope, weaving together disparateelements, where the past has a powerful claim on the present, where the characters are down on their luck, struggling to make ends meet. Ultimately, John Dillinger in Hollywood showcases Sayles’s uncanny ear for language, his skill at crafting character, humor and atmosphere, and shows why he is the winner of the John Steinbeck Award, the O. Henry Award, and others.